Using my keen powers of observation, I have come to believe that Sherlock Holmes is a terrible ingrate. How else to describe someone who berates the narrative skill of Dr. Watson, his faithful chronicler and friend of so many years? Watson, who has made written accounts of the great majority of Holmes' cases. Watson, who assists Holmes in any investigation at the drop of a hat, or even the mere suggestion of the drop of a hat! Read no further than "A Scandal in Bohemia," in which Watson cheerfully obliges the famed detective's request for his cooperation, which requires that he break the law and risk arrest. "I shall be delighted," Watson says. To be fair, it must be said that Watson -- loyal pal though he may be -- is not the master logician that Holmes is. 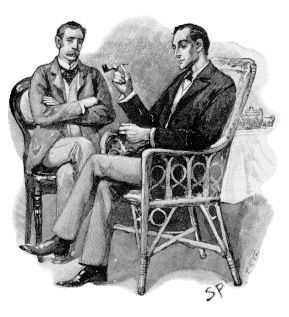 Holmes continually impresses his friend by deducing a person's job, travel destinations, diet, faithfulness in marriage, state of mind or daily goings-on from such simple things as a hat, a sleeve (one of Holmes's fixations), a fingernail, or "the great issues that may hang from a bootlace," as he says in "A Case of Identity." You'd think that Watson would get used to Holmes' fantastic abilities, but evidently not; it seems that every time Holmes deduces something the rest of us would miss, Watson exclaims with fresh astonishment, "How on earth-----!" or some such thing. Still and all, it is Watson's unending capacity for surprise -- borne though it may be of dim wits -- that make him Holmes' ideal chronicler, his "Boswell," as Holmes himself has put it. Were Holmes to relate his own sleuthing, it would surely be a dreadful bore, reading more like a forensics textbook than anything else. Instead, we have Dr. Watson's literate, funny, and altogether entertaining accounts of the cases. Dr. Watson has made Sherlock Holmes! Without Watson, Holmes would have been a successful but by no means celebrated detective. And yet, after all this, Sherlock Holmes insists on playing the literary critic. Get a load of this preposterous tirade from "The Copper Beeches." "You have erred, perhaps, in attempting to put colour and life into each of your statements, instead of confining yourself to the task of placing upon record that severe reasoning from cause to effect which is really the only notable feature about a thing." Watson rightfully defends his efforts, saying "that I have done you full justice in the matter." Sock it to him, Doc! You've done a great job! Still undeterred, Holmes continues, "You have degraded what should have been a course of lectures into a series of tales." That's the thanks he gives his friend and chronicler for turning him into the most famous detective in all of English literature. Bug off, Sherlock, you creep! You go solve the crimes, and let Watson do the literary heavy-lifting. Hell, I'm tempted to boycott the new Sherlock Holmes movie, in hopes of drawing attention to this heinous miscarriage of literary justice. Perhaps readers of this blog will do the same.